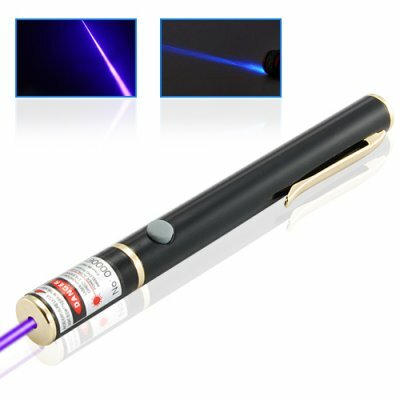 Successfully Added High Power 30mW Blue-Violet Laser Pointer Pen to your Shopping Cart. Unique blue-violet beam - Not your average laser pointer pen! This high quality laser pen is presented in an attractive black-gloss finish with gold accents and soft-touch trigger. When holding the CVKW-G120 you will instantly notice its solid feel and perfect form factor. This is because the CVKW-G120 is built using only the highest quality materials and latest in laser pen technology. Aside from looks and feel, the distinguishing feature of this pen is its unique blue-violet beam that is as powerful as it is attractive. With the CVKW-G120 you are sure to capture the attention of your audience and create that perfect presentation you have always dreamed of! With the simple click of a button you can effortlessly produce a consistently strong blue-violet beam with pinpoint accuracy. This is perfect for highlighting key points during your next big presentation, business meeting, or outdoor adventure. Compact and convenient, you can easily take this pen with you everywhere you go. This professional gadget is the ideal choice for engineers, students, teachers, doctors, anyone who wants their work to stand out, or simply anyone looking to have a little fun!. This pen combines blue-violet optics, all metal casing and a stunningly beautiful finish to bring you a complete and affordable professional package. Costing you less than half the price of similar pens, this is the perfect buy for someone looking for a high quality laser pen, but without the overpriced cost associated with 30mW blue-violet pens found on the market today. Order a few of these pens today and make a great profit on eBay. Or sell them to your friends when they all become jealous after playing with yours! The CVKW-G120 is available in single piece or bulk orders. This product is in stock and ready for shipment within 24 hours. Another awesome product presented to you by your good friends here at Chinavasion!